JERUSALEM, Israel – Channel 10, the third-largest TV studio in Israel, recently acquired a HARMAN Studer Vista 9 digital console from Kilim Electronics, Studer’s Israeli distributor. This upgrade in broadcasting equipment was justified by the studio’s relocation from Tel Aviv to Jerusalem, due to government regulation. As the producers and technicians of Channel 10 were eager to convert from its old analog format to digital, they weighed many factors in choosing the best brand for their new sound setup. On both technical and financial levels, Studer came out on top, presenting its flagship Vista 9 console as the ideal solution for the new studio. Besides its reliability and affordable price range, Studer offers unique advantages that include the reassurance of back-up, as well as technical support from the 63 year old broadcast specialists, led by MD Meir Kilim. Yaron Heizler, head of sound for JCS Studios (host of Channel 10) oversaw the integration of the Vista 9. VistaMix was designed to clean up the mix of unscripted broadcasts such as multi-participant talk shows. Since programs of this nature inherently suffer from both microphone spill and background noise, VistaMix intelligently increases the mic gain on the active speaker almost instantly, while reducing that of the inactive ones. This solves the problem and creates a balanced mix. 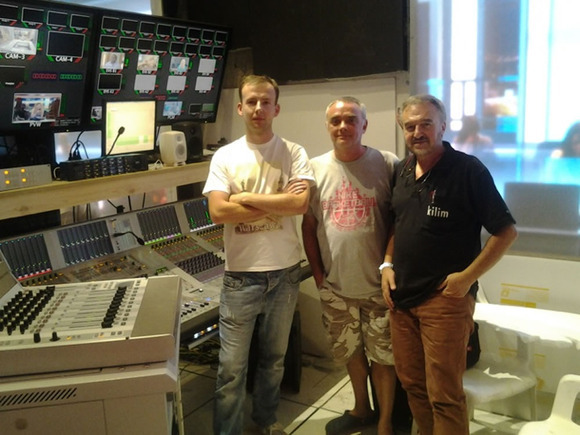 Photo caption: (Left to Right) In Channel 10’s news studio: Ignas Galuškinas, Studer training supervisor, Yaron Heizler, head of sound for JCS Studios (which hosts Channel 10), and Meir Kilim.